When Figo leads Portugal onto the pitch of Lisbon’s Estádio da Luz tonight for the final of the 2004 European Championship, he might finally achieve something that Eusébio, his country’s greatest ever footballer, never managed – to win a major international trophy. In front of a passionate home crowd of 65,000 – and millions more via television sets around Europe – Figo will contest his country’s first-ever tournament final, while Eusébio will watch from the touchline, leaving it to this latest golden generation of Portuguese stars to bring home a much-wanted trophy. In a 15-year playing career at Benfica there were just two seasons in which Eusébio didn’t win either a domestic or European club honour ,but despite scoring 38 goals in 46 games for Portugal he was never to win a tournament with his country, his closest shot coming with a third-place at the 1966 World Cup Finals in England. Over the years, Portugal have promised much but have always failed to deliver. 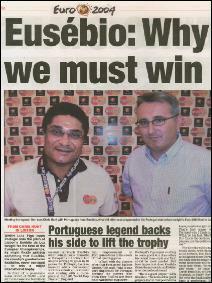 This time Eusébio thinks that they will finally lift a trophy. The true stars of European football – like Zidane, Beckham, Henry – have failed to shine in this tournament, but Portugal’s Figo is just starting to come good at a time when his world class style and flair could be most needed. But how important does Eusébio think the maverick midfielder is to the national team? “He is a good player,” says Eusébio. “We have other good players, but in that position he is the best. You have other important players like Ronaldo, Simão Sabrosa, the defender Ricardo Carvalho, the left-back Miguel. We have some good young players for the 2006 World Cup in Germany – and I think we are prepared for that now. Figo might not be there but that depends on Figo. The Greeks will be tough to break down, with their rock-solid defence, but Eusébio is so delighted to see Portugal in the final that he really doesn’t mind what team will be lining up to face them. “It could be any team,” he says. “The Czech Republic, or Greece, or England, or Italy? Any team. We’re in the final and we don’t have a preference. But for football maybe it would have been better if it was the Czech Republic, because they play with the same style as Portugal – with many goals.